While fireworks filled skies across the nation at the start of July, Kilauea volcano on Hawaii’s Big Island might have put on the most spectacular show this week. 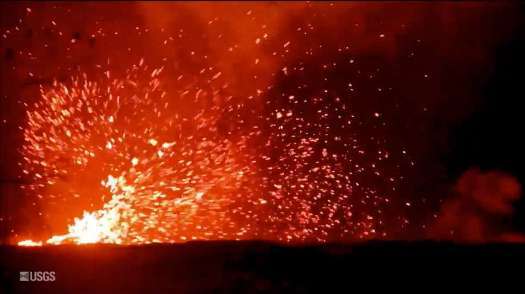 Scientists at the United States Geological Survey used a telephoto lens to capture video footage of the whirlwind above an river of lava flowing from an opening in the ground known as fissure No. 8. The activity lasted for 10 minutes on July 2 and threw lava several meters away, the USGS reports. Lava has destroyed more than 600 homes on the Big Island since the volcano began spraying molten rock out of a vent on a residential street on May 3. At Kilauea’s summit, there continue to be explosions that shoot plumes of ash into the sky. Another ongoing hazard comes from lava meeting the ocean. Scientists warn against venturing too close to the action, saying it could expose people to dangers from flying debris.